Philippe François Marie Leclerc de Hauteclocque (French pronunciation: ​[filip ləklɛʁ də otklɔk]; 22 November 1902 – 28 November 1947) was a French general during the Second World War. He became Marshal of France posthumously in 1952, and is known in France simply as le maréchal Leclerc or just Leclerc. 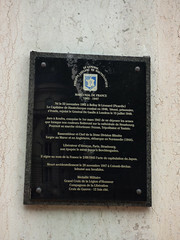 The son of an aristocratic family, de Hauteclocque graduated from the École spéciale militaire de Saint-Cyr, the French military academy, in 1924. After service with the French Occupation of the Ruhr and in Morocco, he returned to Saint-Cyr as an instructor. He was awarded the croix de guerre des théâtres d'opérations extérieures for leading goumiers in an attack on caves and ravines on Bou Amdoun on 11 August 1933. During the Second World War he fought in the Battle of France. He then became one of the first to make his way to Britain to fight with the Free French under General Charles de Gaulle, adopting the nom de guerre of Leclerc so that his wife and children would not be put at risk if his name appeared in the papers. He was sent to French Equatorial Africa, where he rallied local leaders to the Free French cause, and led a force against Gabon, whose leaders supported Vichy France. From Chad he led raids into Italian-controlled Libya. After his forces captured Kufra, he had his men swear an oath known today as the Serment de Koufra, in which they pledged to fight on until their flag flew over the Strasbourg Cathedral. The forces under his command, known as L Force, campaigned in Libya in 1943, covered the Eighth Army's inland flank during its advance into Tunisia, and participated in the attack on the Mareth Line. L Force was then transformed into the 2e Division Blindée, although it was often referred to as La Division Leclerc. It fought under Leclerc's command in the Battle of Normandy, and participated in the liberation of Paris and Strasbourg. After the end of World War II in Europe in May 1945, he was given command of the French Far East Expeditionary Corps (Corps expéditionnaire français en Extrême-Orient, CEFEO). He represented France at the surrender of the Japanese Empire in Tokyo Bay on 2 September 1945. He quickly perceived the necessity for a political solution to the nascent conflict in Indochina, but once again was ahead of his countrymen, and was recalled to France in 1946. He was killed in an air crash in Algeria in 1947. 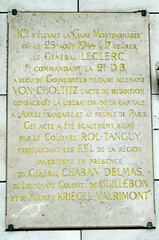 Le General Philippe Leclerc de Hauteclocque Maréchal de France 1902 - 1947 Né le 22 novembre 1902 à Belloy St Léonard (Picardie) Le Capitaine de Hauteclocque combat en 1940, blessé, prisonnier, s'évade, rejoint le Général De Gaulle à Londres le 15 juillet 1940. Jure à Koufra, conquise le ler mars 1941 de ne déposer les armes que lorsque nos couleurs flotteront sur la cathédrale de Strasbourg. Poursuit sa marche victorieuse: Fezzan, Tripolitaine et Tunisie. Rassembleuer et Chef de la 2ème Division Blindée forée au Maroc et en Angleterre, dé,barque en Normandie (1944). Libérateur d'Alençon, Paris, Strasbourg, son épopée le mène jusqu'à Berchtesgaden. Il signe au nom de la France le 2/09/1945 l'acte de capitulation du Japon. Meurt accidentellement le 28 novembre 1947 à Columb-Béchar. Inhumé aux Invalides. Médaille Militare Grand Croix de le Légion d'Honneur Compagnon de la Libération Croix de Guerre - 12 fois cité. English translation: The General Philippe Leclerc de Hauteclocque Marshal of France 1902 - 1947 Born on November 22, 1902 in Belloy St Léonard (Picardy) The Captain of Hauteclocque fought in 1940, wounded, prisoner, Escapes, joined General De Gaulle in London on 15 July 1940. Jure at Koufra, conquered on 1 March 1941 not to lay down the arms That when our colors float on the cathedral of Strasbourg. Continues its victorious march: Fezzan, Tripolitania and Tunisia. Gather and Lead the 2nd Armored Division Drilled in Morocco and England, deck, bark in Normandy (1944). Liberator of Alençon, Paris, Strasbourg, his epic leads him to Berchtesgaden. He signed on behalf of France on 2/09/1945 the act of capitulation of Japan. Accidentally died on 28 November 1947 in Columb-Béchar. Buried at the Invalides. Military Medal Grand Cross of the Legion of Honour Companion of the Liberation Cross of War - 12 times quoted. A la mémoire du général LECLERC de HAUTECLOCQUE né à Belloy St Léonard (Somme). Libérateur de la patrie 1902-1947. La population d'Amiens reconnaissante par le combat et la victoire du Tchad au Rhin par Paris et Strasbourg. 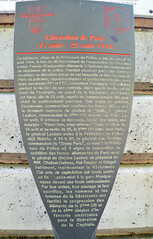 English translation: In memory of General Lleclerc de Hauteclocque born at Belloy St Léonard (Somme). Liberator of the Fatherland 1902-1947. The population of Amiens grateful for the fight and the victory of Chad to the Rhine by Paris and Strasbourg.